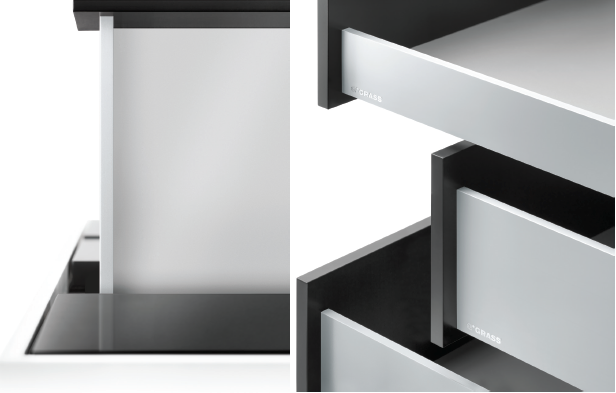 Vionaro - the cubist drawer system with classy, yet minimalist styling. Vionaro combines the Dynapro slide system with a succinct shape, slimline design and top quality materials. The pure elegance of Vionaro makes furniture look good whether it’s in the kitchen, bathroom, living room or bedroom. The collaboration between Sensomatic comfort system and Vionaro make a harmonious multifunctional system which aims to combine the advantages of handle free opening with the elegance of cushioned closing. Both designers and end users will enthusiastically welcome Vionaro.